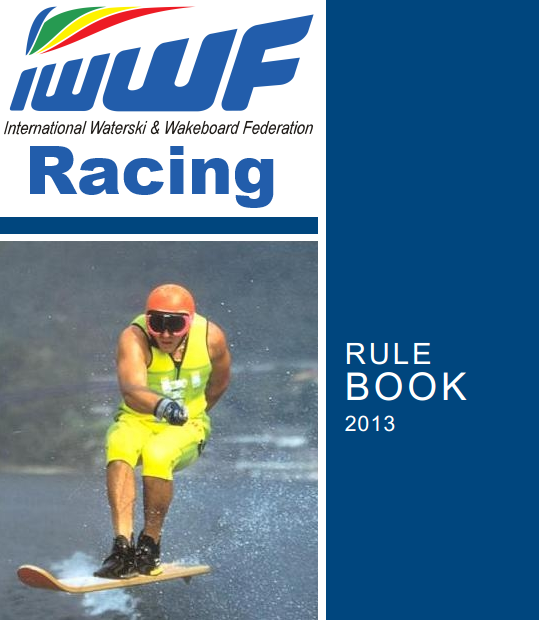 The 2013 IWWF Racing Rules are available for download below. Teams participating at the 2013 World Championships should be familiar with this rule book. The 2013 E&A Racing Rules have been ratified by the E&A Racing Council. Edited by Vera Van den Bossche, Thea Klarenbeek & Jules Leysen E&A Racing Council members and thanks to all officials that helped with the updates. Any new or re-worded rules are indicated in red. 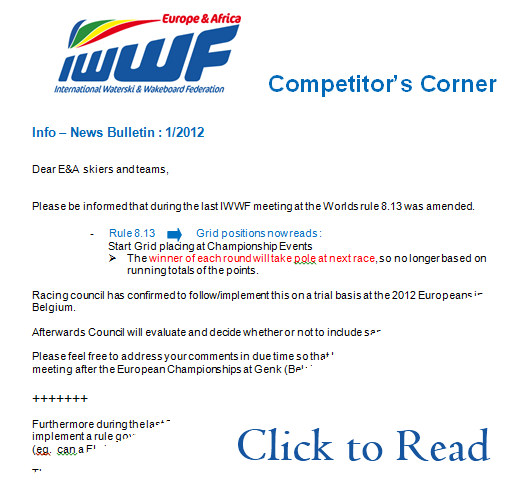 The Europe & Africa Racing Council has published the E&A Racing Rules for 2012. Note that any new or re-worded rules are indicated in red. Courtesy of Vera Van Den Bossche, below is the list of (re)elected Council members as voted at the E&A Congress in Thessaloniki (Greece) on January 28th, 2012. Click here to open and print the list with contact details. On 11th January 2012, the IWWF announced (here) that Australian Chris Stout from Racing and Belarusian Tournment skier Natalia Berdnikova had been selected as 2011 IWWF Athletes of the Year. Click here to open and download the first EAME Competitors’ news bulletin for 2012. After 50 years as a member of Penarth (Wales) Water Ski Club and nearly 30 years as a judge, Howard has called time on his involvement in the sport of water ski racing. He will still be renewing his membership but will no longer be judging at National or International events. thank for the efforts taken, has decided to end this nomination due to new family circumstances. The 1st official bulletin for the 17th World Water Ski Championships to be held at Moreton Bay Australia is due to be released very soon. Courtesy of Vera Van Den Bossche (E&A Racing Council Secretary-General) below are the minutes of the Competitors meeting held at Arcos de la Frontera in Spain during the recent European Water Ski Racing Championships. An E&A meeting will be held during the week of the European Championships in Spain. I will be putting my report together next week, please let me know if there is anything you would like me to address?. Now that Dusty Schulz has taken the reigns as Chairman of Racing on the IWSF Racing Council, a far more pro-active approach is being taken to help progress the sport on an international level. IWSF Racing Council – What’s Happening? The IWSF Racing Council hosts a “Competitors’ Meeting” at each World Championship event. This gives teams a rare chance to discuss their sport with the committee that is charged to take the sport forward throughout the world. To date, there seems to have been no public communication on the time, date and venue of this meeting in Belgium. The IWSF Racing Council is expected to confirm the time, date & venue of the 2009 Competitors’ Meeting. The sooner this is communicated, the less competitors will be inconvenienced at the Worlds. N.B. The Racing Council’s own meeting has already been confirmed. At the IWSF Racing Council meeting in July 2008, the Racing Council agreed to create a raffle which would raise funds to help cover the costs incurred by officials, and to help event organisers. This is a superb initiative and whilst no details of the raffle have been publicised yet, the IWSF Racing Chairman Glen Coles will naturally ensure that actions agreed and minuted in July, will be performed and communicated within the sport. The idea is this, to create a raffle for a round trip for two to the Belgium 2009 worlds etc. or take $5000 in US dollars. Each member of council will sell 15 tickets, which would bring in $16,500 and remaining balance is $10,000 after expenses. The council could use the money however they deem necessary for travel expense or to federations events. The whole idea is to have the council stand alone and the money could be put to good use for the federation or organizers of the event to not have pay officials at the specified events and put it back in to encourage them to put on a World event. Any number of things could be done with the money to help with research development etc. Robbie Llewellyn thinks this is a fantastic idea. This needs to somehow be shown that this is going to help competitors in the long run. Glen Coles states that it runs in many places there are some complications. Every country is going to have difficulties with procedures. Robbie suggests solution to have US – Pan-Am to run this promotion since it is legal in the states. Dusty asks how to move forward with this proposal. Do we advertise how many tickets are sold, or keep it open so you could sell more. Extra money raised would be given to each federation for a ski school and junior development. Do this every two years as a regular theme. The key to make this grow is to get outside ski racing. Suggestion out there to do a 50/50 split for the donations and public relations from the council to raise money for the competitors. Right now the council only gives their time. Greg Dutton suggests to double the amount of tickets required to help raise more money. Jules Leysen would like to make contracts with sponsors for the IWSF to help offset costs. Pay the organizer to help the council set things up at particular events. Possible to work with sponsors for the top three races around the world and set them up at each event. VIP areas. Do you forget the raffle and just do that. Jules Leysen suggests that you do both raffle and sponsor arenas. Start with the raffle for 2009 worlds and then lead to getting sponsors for the 2010 Diamond R ace as a start. As a summary everyone is on board to start with raffle and work towards starting the process. Kick off the raffle and show what council is doing for the sport. Put a ceiling on the amount of tickets of 300. The money needs to be divided evenly to every region and designate how and where the money was spent. An accounting report needs to go back to the council. IWSF Racing council should be able to set up our own account and submit a Treasurers report to the IWSF. 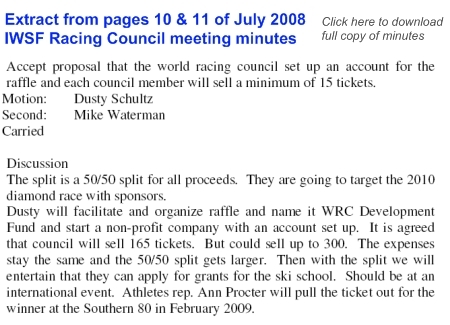 Accept proposal that the world racing council set up an account for the raffle and each council member will sell a minimum of 15 tickets. The split is a 50/50 split for all proceeds. They are going to target the 2010 diamond race with sponsors. Dusty will facilitate and organize raffle and name it WRC Development Fund and start a non-profit company with an account set up. It is agreed that council will sell 165 tickets. But could sell up to 300. The expenses stay the same and the 50/50 split gets larger. Then with the split we will entertain that they can apply for grants for the ski school. Should be at an international event. Athletes rep. Ann Procter will pull the ticket out for the winner at the Southern 80 in February 2009. Robbie suggests that if all tickets are sold, start another raffle after. 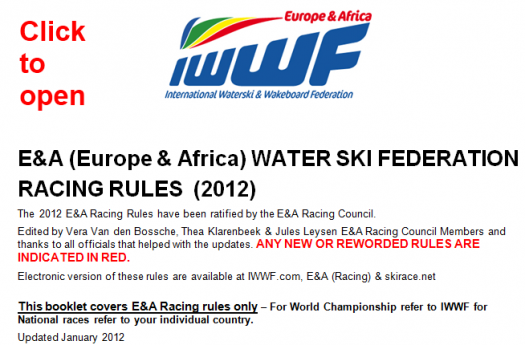 Whilst the IWSF Racing Council choose not to remove rule 3.03, National Federations have jumped to the rescue to save their skiers from the constraints that this rule poses for international skiers. Months after the IWSF Racing Council dictated that Chris Stout, Peter Procter and Darren Kirkland could not ski with the teams of their choice at the 2009 World Water Ski Racing Championships (if selected for their national teams), international pressure has resulted in an about-turn for Britain’s Darren Kirkland. The IWSF Racing Council hosted a two day meeting at Long Beach USA this year. The minutes have been circulated the IWSF Federations and they are also available below. 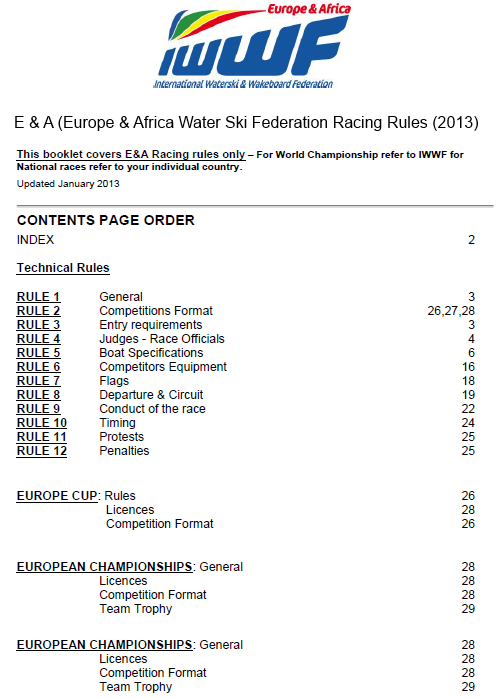 Months after the Racing Council met at Long Beach to make amendments to IWSF Racing Rules, the rule book to be used at the 2009 World Water Ski Racing Championships in Belgium has not been published. There have been a lot of emails, web site posts, phone calls and meetings about the IWSF’s decision to prevent some of the best ski racers in the world from skiing with teams of their own choice. In my opinion, this ridicules the sport and the skiers who put their hearts into building a good team when the opportunities come along, and the crews who plough their hard earned money into the sport. If you want to see some of the world’s best water ski racers not be dictated to by a committee, talking to your respective IWSF Racing Council members is something that you might like to consider. Glen Coles & Meryl Lee – What Are they Doing? Do you know what Glen Coles & Meryl Lee are doing to progress water ski racing? If so, support them with your comments (insert them below) because I and many others have no idea what they are doing. In July I approached Dusty Schulz and asked him to recommend to Glen Coles that he resigns ‘gracefully’ as Racing Council Chairman after over 25 years as Chairman. Dusty refused. I then approached the IWSF Racing Council at our meeting at Long Beach in July and proposed that Glen Coles steps down as Chairman. I actually asked them all to think hard and put their hands on the hearts when they voted. The majority felt that Glen was doing a great job of running the sport. So my proposal gained insufficient support. 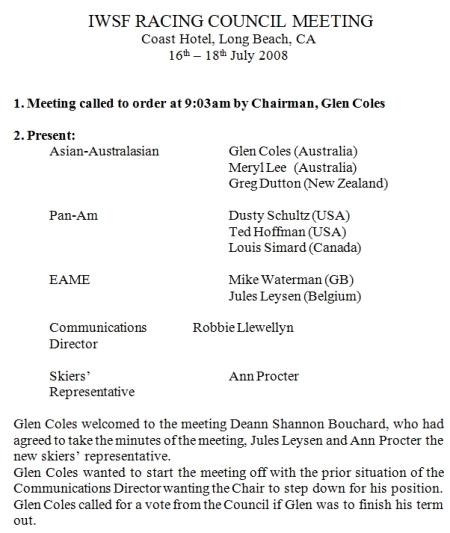 After 9 years on the Racing Council, my view is that Glen Coles and Meryl Lee are the people who really need to be removed from the IWSF Racing Council. I have resigned as it is almost impossible to make and radical changes with people like them at the helm. The survey that was originally started has been attacked by someone who can vary their ip address and vote many times. But people still have ample opportunity to express their views by taking this vote by posting comments below and including their names. Your IWSF Racing Council Representatives have their contact details published on the IWSF web site here – you can write to them personally if you wish to address any issues with them directly. Public Opinion is Clear – will the IWSF Listen to a 90% Majority? 207 votes cast in 3 days. An overwhelming 89.4% of people (185) in ski racing who voted, want to see Peter Procter, Darren Kirkland and Chris Stout, be allowed to ski with the crews of their choice, if selected for the 2009 World Water Ski racing Championships. 10.6% of people support the decision of the IWSF Racing Council, some of the voters are Racing Council members. Below are the opinions of 57 people who expressed opinion on the matter, many of whom have extraordinary experience in this sport. So do we have a governing body of sport that does what it wants? Or do we have a governing body that is able to sit up, and take notice of its competitors, think, and then admit “we got it wrong – let’s support the people who make this sport possible and let’s make progress”? – Let’s see. The Racing Council has been using Rule 3.03 for a purpose for which it was never intended. Matthew Northover (Former observer of Darren Kirkland) explained why, after he spoke, a few days ago with the man who introduced the rule with Terry Bennett in 1978 – John Hoiles of Whitstable, UK. Matt writes …Having read all the recent comments regarding Rule 3.03, I thought it would be helpful to contact John Hoiles who in 1978/79, along with Terry Bennett formulated the Rule Book which in essence still stands today. John explained that the thinking behind the Rule was purely in the interest of safety and nothing to do with the Team trophy. It was thought at the time, prior to the first World, Skiers from around the Globe would converge at Whitstable, without their boat or crew and be allocated a Team upon arrival (so the speak). Both John and Terry felt, that it would be dangerous for this to happen, as the possible new crew would not know the capability of the skier and therefore this rule was created. Sadly, the Racing Council over the years have not reviewed Rules which were made some 30 years ago. Perhaps it’s now time that the IWSF admits that it has failed to implement the rule for its true purpose. Perhaps it’s time to remove a rule that was fit for purpose 30 years ago but which is not fit for purpose in the 21st century. The 1st IWSF Racing Council Chairman John Hoiles, did what was right for the sport in 1979, along with the help of the wonderful Terry Bennett. Let’s see Glen Coles, the 2nd IWSF Racing Council Chairman (in his last year of Chairmanship) do what is right for the sport for 2009. Thirty years ago, international teams in ski racing were few and far between. These days, it’s not unusual to see skiers from different countries teaming up with crews from other nations. Sadly, some people who run this sport are still stuck in the old days and their old ways, with little appreciation of progress. They can’t see that they are out of touch with a new world of water ski racing. After nine years, I have decided to walk away from the IWSF Racing Council as I no longer wish to be associated with some of the poor decisions that are being made which affect water ski racing and the hard earned careers of our athletes. 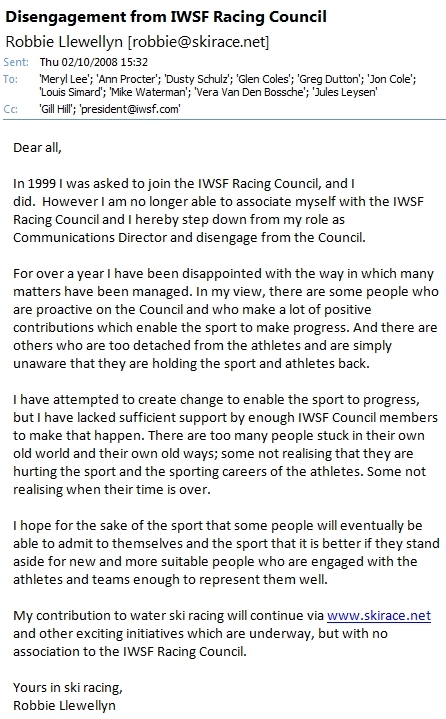 My resignation letter below was sent to the Racing Council and the IWSF President and Secretary General today. I shall continue to contribute to the sport and there are some extremely exciting international developments simmering in the background that I will write about at the right time in the near future. Mike Waterman asked me to reconsider my decision and below is my reply. Thanks for your kind words. Unfortunately, despite support from you and a few others to initiate change, the majority of the Racing Council has not supported that change. There are too many people stuck in their old ways, who are too out of touch or who don’t wish to speak out to do the right thing for the sport and its athletes. A Chairman for over 25 years who rarely goes to a ski race? Come on that’s ridiculous! But somehow the majority of Racing Council members believe that is a good thing for ski racing (recall the vote at Long Beach). That’s just one example of the sport’s governing body living in the past. To be frank, it is now an embarrassment to be associated with the decisions and poor management that we are now witnessing. The collective decision of the IWSF Racing Council in its wisdom, is now steering the sport in reverse gear over a cliff top. I won’t be part of that and I won’t be party to ruining the opportunities given to some of our best athletes. My involvement with the IWSF is over. However my involvement with something very new and exciting for ski racing is just beginning. The IWSF has not been prepared to embrace change, so the change will now happen without the IWSF. 18 July update – subsequent to the notice below, a vote was taken by the IWSF Racing Council this week and a majority voted for Glen Coles to remain as Chairman of the IWSF Racing Council. 18 July update – during two days of IWSF Racing Council meetings at Long Beach this week, many items were addressed, changes made, new ideas discussed, some to be implemented and others to undergo more discussion before decisions are made. More details will be made available when the minutes are published, but overall, the meeting wasÂ productive. Ann Procter has asked competitors to express their thoughts with her about World Championship race duration (more here). You can also take part in the survey below. IWSF Athlete’s Representative Ann Procter is reaching out again to racing competitors all over the world, in an effort to gain their feelings within the sport. Ann is doing this so that she can represent the world’s competitors as best she can, when attending the next IWSF Racing Council meeting at Long Beach in July. IWSF President Kuno Ritschard writes about the International Olympic Committee’s decision not to include water skiing in the list of sports which will be further evaluated to become one of the two new sports at the 2016 Olympic Games. 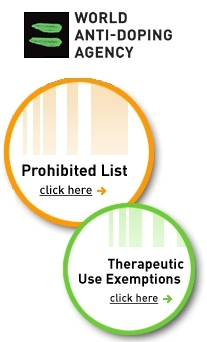 Following its approval by WADA’s Executive Committee on September 22, the 2008 List of Prohibited Substances and Methods is now available. 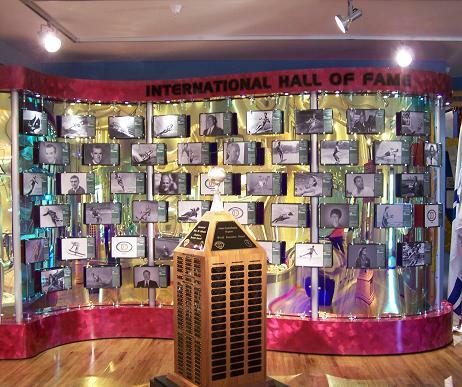 The International Water Ski Federation (IWSF) Hall of Fame is housed in the USA Water Ski Hall of Fame building in Florida USA but the IWSF Hall of Fame has its own list of inductees and criteria for nominations. The USA Water Ski Hall of Fame is not to be confused with the IWSF Hall of Fame. Information about the IWSF Hall of Fame along with a list of inductees is published by the IWSF here. An article about Water Ski Racers’ success in the USA Hall of Fame is published here. The most notable Water Ski Racer inducted into the IWSF Hall of Fame is Chuck Stearns (photo below). Chuck is also inducted into the USA Hall of Fame along with Marsha Fitzgerald and Mike Avila. Kuno Ritschard, President of the IWSF, addressed IWSF members in early 2007 in this letter. America’s Dusty Schulz spent a number of days with Mike Waterman, Vera van den Bossche and others in Belgium last week, inspecting the proposed sites for the 2009 World Water Ski Racing Championships. At the IWSF World Congress held on Thursday 30 August 2007 in Linz, Austria, the IWSF had received a bid from Belgium for the 2009 World Racing Championships. Today, Kuno Ritschard, President of the IWSF announced that the IWSF Congress has approved Belgium’s bid to host the 2009 World Water Ski Racing Championships unanymously, subject to the IWSF World Racing Council’s approval of the technical requirements. The 2009 World Water Ski Racing Championships moved one step closer to finalisation yesterday when IWSF President Kuno Ritschard confirmed that the IWSF Executive Board has made the decision to submit the Belgian bid to the IWSF World Congress. The new IWSF Athlete’s Representatitive for Racing is Ann Procter. As most people are aware, Ann is a three time Women’s World Champion and a one time Junior Girls World Champion. 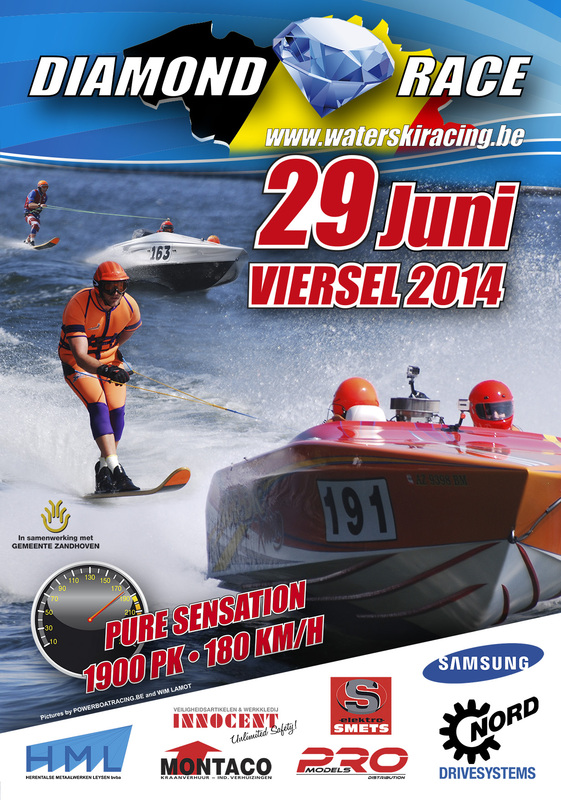 On 19 July, Belgium submitted its bid to the IWSF to host the 2009 World Water Ski Racing Championships. This meets the deadline date that was set by the IWSF Racing Council in May in New Zealand. As announced on 6 March, there will be an election for the position of Athlete’s Representative at the World Championships in New Zealand. British media reports:Â Howard Smith of Cardiff, UK has been selected as Chief Judge for the bi-annual 15th World Water Ski Racing Championships which are being held at Rotorua, New Zealand between May 10th and 20th 2007. Howard will be the first Welshman and only the 3rd British Official to have been selected in 30 years of World Championship racing. The 2007 World Racing Council Technical Meeting will be held in Rotorua, New Zealand on the 17th May 2007. There will be a vote for the position of Competitors’ Representative during the NZ Worlds in May. Kim Lumley currently holds this position and whilst Kim can be re-nominated, other candidates can also be nominated.